Our Oil and Gas leads are all survey based. 1. Establishes suitability (liquidity) of the person being surveyed. 2. Acknowledges him/her as being an accredited investor, and confirms that he/she has an available $25,000 liquid risk capital. 3. Serves as an introduction of the company directors or owners in order to start and develop a pre-existing relationship, usually defined as a 30 cooling-off period, with the person being surveyed. Once the company successfully establishes a pre-existing relationship with the person being surveyed, the potential client is introduced to the investment opportunity and a Private Placement Memorandum is mailed out to him/her. Another lead list that is great for Oil and Gas is our Private Placement List. Much like the Oil and Gas prospects, these leads are qualified for a minimum of $25,000 to as high as one quarter million dollars. These Private Placement leads are 95% Accredited Investors. 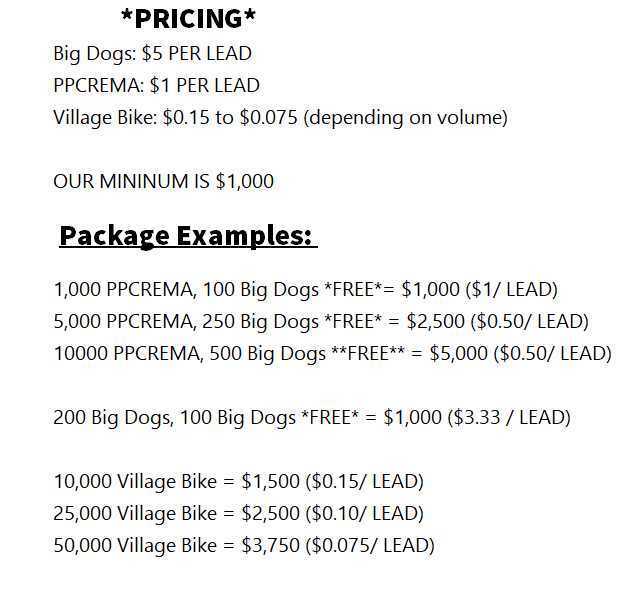 Call for current prices. Reach high net worth individuals interested in gas and oil investment opportunities with qualified lead generation lists at SalesLeads.TV.